Once some monkeys were sitting in a tree. The tree was at such a placed, where construction of a temple was going on. A carpenter was sawing a huge log to cut it into two parts.Just then the bell rang for the lunch break. The carpenter pushed a wedge into the split portion of the half sawed log and went to take his lunch, along with other workers. When the monkeys saw that there was nobody around, they jumped down from the tree and came near the temple. They began to play with the tools lying there. One of the monkeys, who was very curious about all those things, went round the half sawed log. Then sat on top of it. He spread his legs on both sides of the log, whereas his tail dangled through the split portion. 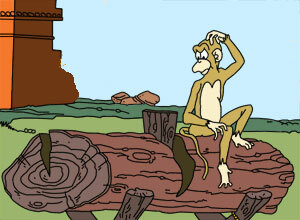 Now the monkey started prying the wedge out of the log with his hands. Suddenly, the wedge came out. The split parts of the log firmly snapped shut together crushing the monkeys tail in between. The monkey cried in pain and jumped off the log, but his tail was cut off for ever.